While the summer months are winding down, pink eye can still be a concern for cattle producers. A.J. Tarpoff, K-State Research and Extension beef veterinarian, has tips to help minimize the effects of this disease in cattle. Weaned calves may lose up to 10 percent of their body weight as a result of the disease, according to Victoria Agriculture (Australia), The disease may lead to blindness and possibly even death due to starvation, thirst, and accidents due to loss of sight. Pink eye is caused by several factors working together, Tarpoff said. The main cause is the ever-changing bacteria, moraxella bovis. Many subtypes of that bacteria can be found even within one infected animal, which contributes to difficulty in treating it. Other factors include, UV light, which irritates the eye, tall foliage such as grass or weeds which can scratch the eye, and dust which acts as a direct irritant. "Flies work to cause pink eye in two different ways," Tarpoff said. "First, they can irritate the eyes directly by flying around and irritating the cornea. Secondly, flies directly feed on the secretions from the eye. Once they feed off of those secretions, they pick up the bacteria and take it over to another animal and infect that animal, too." Tarpoff suggests producers think of early detection as if they themselves were poked in the eye and had the associated side effects. An infected animal will often show the same symptoms: discomfort, tears, straining to open the eye, and possibly the eye staying shut. One guaranteed sign is increased tearing, he said. Often dirt will get attached to the tear stains. This is especially visible in light colored cattle. There is no set time period from once the disease is evident until it is a threat to the health of the eye. "As the disease progresses it develops an ulcer typically in the center of the eye," Tarpoff said. "Either one or two things happen – it starts to heal or it builds up pressure on the inside of the eye from the inflammation and possibly ruptures." "The biggest treatment option I recommend is to work with your veterinarian as they are familiar with what is happening in the area as well as what is and is not working," he said. "Working with your veterinarian also gives producers a chance to establish a veterinarian-client patient relationship, which is extremely important when treating animals with antibiotics." "The mainstay treatment that has been used for years is injectable oxytetracycline," Tarpoff said. "It still has a very good level of effectiveness however, by working through a veterinarian he or she may be able to take samples if a producer is experiencing a large outbreak. There may be different bugs in the eye that may need a different type of treatment." He also recommends gluing a patch over the infected eye. This minimizes solar radiation exposure and other irritants so the eye is more comfortable. In addition, it covers secretions from the eye so that flies cannot transmit the bacteria to other animals. The length of recovery time generally comes down to the severity of the infection and individual variability. If the animal is immunocompromised for any reason, it won't respond like it should regardless of antibiotic use. If the animal is otherwise healthy, it should respond well to early treatment. A preventative herd health program through a veterinarian aids producers in keeping optimal herd health, Tarpoff said. A proper vaccination program manages viruses such as infectious bovine rhinotracheitis, commonly known as IBR, and bovine viral diarrhea, or BVD, that can affect the severity of pink eye. "There are several options for vaccines to control pinkeye," the veterinarian said. "Some issues with vaccines are they are given too close to when the animal becomes infected. It takes two doses and several weeks to build immunity." Moraxella bovis has many types and sub types, which also presents challenges. Vaccines only have certain strains and are not all cross protective. In some cases they are very helpful but if given too late in the year or if a vaccine is for a different strain, it will not work. Proper nutrition assists in preventing pinkeye. Assuring an animal has all of the essentials to perform well helps to keep its immune system functioning. Fly control is also essential, Tarpoff said, since flies spread the disease rapidly. 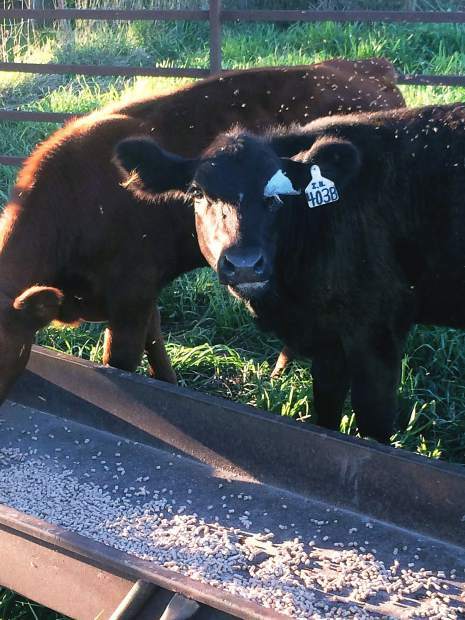 Effective fly control plans may include insecticide sprays, special ear tags, or cattle rubs. Environmental controls to prevent the spread of pink eye include cleaning areas where flies reproduce such as in stagnant pools of water and areas where manure builds up. Clipping pastures may also help – when cattle graze in tall forages they may scrape their eyes and get the disease. Trimming grasses reduces a physical irritant to the eye. It's also helpful for cattle to have shade from the UV radiation found in direct sunlight.